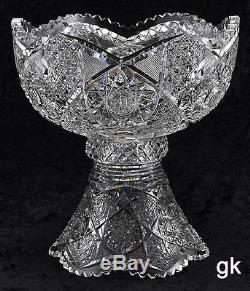 Stunning 2 Pc Pedestal Based Cut Glass/Crystal ABP Punch Bowl Diamond Designs. Presented is a 2 piece Pedestal based cut glass/crystal ABP Punch Bowl. This piece features beautiful diamond, criss-cross, hobstar, and star burst designs. Height of punch bowl: app. Height of punch bowl on pedestal: 11 1/4 inches. Diameter of outer rim: 10 1/4 inches. Diameter of inner rim: 9 3/8 inches. Total Capacity: 96 liquid oz. (This equals twelve 8 oz cups). There are chips on the teeth that have been ground down. The knob on the bottom of the punch bowl is chipped and ground down. However this is not noticeable when on the pedestal. There are flea bite chips on the some of the high points of the crystal on the side of the punch bowl. The edge of the inner rim of the pedestal has some chips. However these are not seen when the punch bowl is on the pedestal. These are hardly noticeable and do not take away from the beauty of the piece. Enjoy this piece of beauty!! Please scroll down the page to see all of our photographs. If you STILL do not receive a response , please check your spam or trash folders, as your account may have marked our message as spam. We do not work over the weekends. If you send us a message over the weekend, we will respond promptly on Monday. This is an estimated time. If you send us a message us over the weekend, we will reply promptly on Monday. During holidays, our hours may vary. Powered by SixBit's eCommerce Solution. The item "Stunning 2 Pc Pedestal Based Cut Glass/Crystal ABP Punch Bowl Diamond Designs" is in sale since Friday, May 27, 2016. This item is in the category "Pottery & Glass\Glass\Glassware\Cut Glass\American Brilliant". The seller is "grandmasattic3" and is located in Essex, Massachusetts. This item can be shipped worldwide.